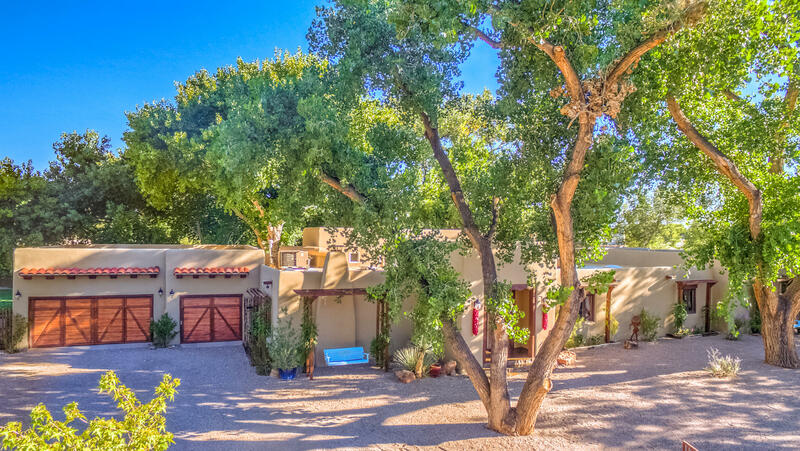 Under numerous aged Cottonwoods is this adobe hacienda that oozes quality and authenticity. From the hand-chiseled slate floors to the diamond plaster walls and rough- cut timber beams, one experiences old-world charm with all of the comforts of an au-currant home. Top grade granite throughout, Pella wood windows, Viking appliances radiant heat, three kivas and refrigerated air are just some of the details. A large gracious porch with fireplace is a place to enjoy the views of the mountains or just the verdant environment. The kids can play in an outrageous tree house or enjoy a dip in the swim pool/overiszed hot tub, or help with the gardening in the hops or zen gardens.Truly an exquisite setting of peace and tranquility well-located to dining, shopping and schools.